70 % of the earth’s surface is covered in water, some 1.36 billion cubic kilometres of it in total. Water is essential to life on earth. Water changes state and can exist as a solid, a liquid and gas or vapour. These properties enable water to act as a major mechanism in the regulation of global temperatures. Driven by energy from the sun, the water cycle of evaporation and precipitation cools the world and delivers life-giving fresh water all over the planet. The amount of energy locked into the water cycle is huge. Millions of tons of water fall onto land as rain and then under the force of gravity flow back downhill towards the sea. Water has considerable mass, weighing 1,000kg per cubic metre. 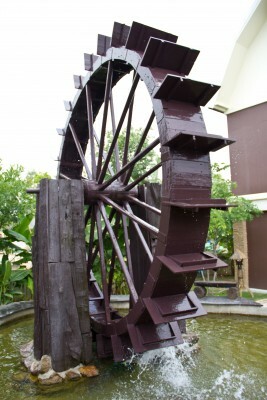 Where water is flowing as in a river or stream, it has both mass and velocity and therefore possess kinetic energy. Mankind has harnessed this energy for centuries building ever more sophisticated water driven mills to grind corn and saw wood. 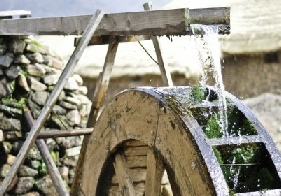 The earliest factories of the industrial revolution in the 19th century also relied on water power to drive spinning and weaving machinery. 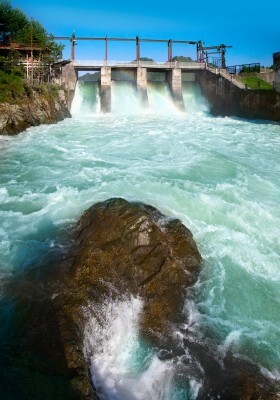 In the 20th century hydroelectric dams were built to generate electricity. By building dams, the water flow can be controlled, and the ‘head’ or height through which the water falls maximised. The higher the head the greater the potential energy available and the more power can be extracted. Faced with the challenges of climate change and the finite supply of fossil fuels, tapping the energy locked into the water cycle is becoming more important in the 21st century. Water is 800 times denser than air and this makes it relatively easy to extract from a water flow. 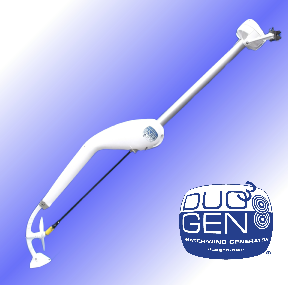 Eclectic’s DuoGen product for cruising yachts operates as both wind and water generator. On passage with the DuoGen’s water mode deployed, it is the yachts motion through water that produces the power. However the effect would be identical if the yacht were stationary and the water was flowing past it, as occurs when anchored in a tidal flow. At normal passage speeds, i.e. 6 knots, DuoGen’s water mode produces around 200 amp hours per day. That is sufficient electricity to cover all the power needs of a typical blue water yacht. This power output is achieved with a water impeller only 300mm in diameter and a minimal loss of boat speed. By contrast, the DuoGen’s air rotor is 1100 mm in diameter, and would require a continuous 17 knot wind speed over 24 hours at the turbine rotor, to match the water output. As yachts usually sail with the wind on or abaft the beam, the boat speed can be effectively subtracted from wind speeds. This suggests that a continuous 24 hour true wind speed of 23 knots plus would be needed to match the power output which the DuoGen’s water mode can achieve in wind speeds of 12 knots or less. high drag. Conversely, it prevents the impeller surfacing at high boat speeds, a common problem with tow rope type generators. A combination of the DuoGen’s diving plane and the gimballing at the transom enables the DuoGen’s water impeller to fly through the water largely unaffected by the movement of the yacht. Units attached rigidly at the stern experience rapid vertical accelerations as the yacht pitches in a seaway, and this has a negative effect on efficiency.